Following the Setting the Agenda Event in May, the Emerging Ideas event on 21 June will allow you to review initial ideas, help refine proposals and inform a prioritised action plan for a new Blythswood District Regeneration Framework. 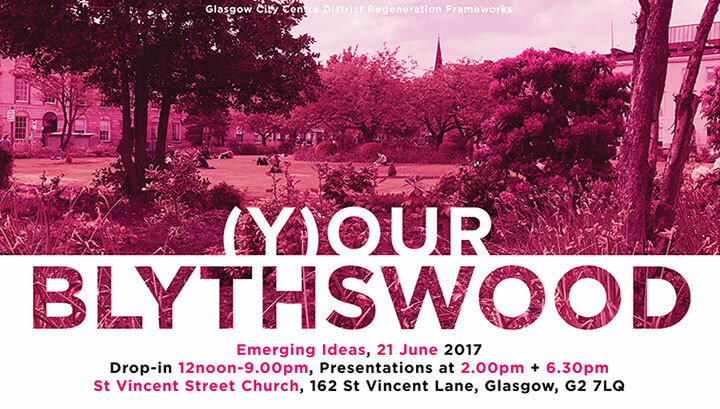 Drop-in at St Vincent Street Church (side entrance) anytime from 12noon til 9pm on Wednesday 21 June to share your ideas and help shape the regeneration of (Y)our Blythswood over the next 10 years. Come along to presentations and workshops at 2pm and 6.30pm to review and refine the Emerging Ideas. 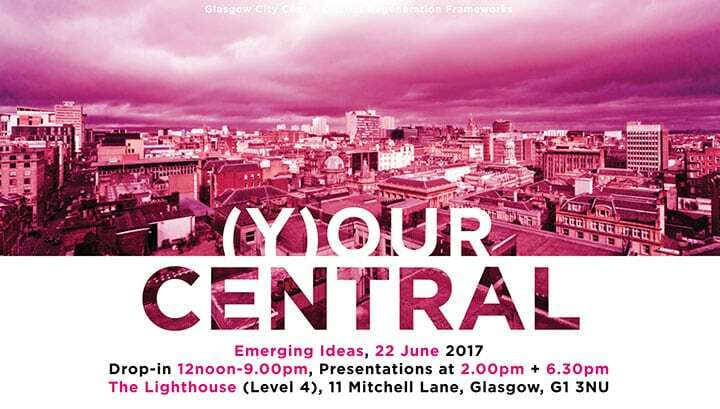 (Y)our St Enoch Emerging Ideas Event follows on from the ‘Setting the Agenda’ event in March which helped set the project agenda. The Emerging Ideas Event on 24 May will allow you to review initial ideas, help refine proposals and inform a prioritised action plan for a new St Enoch District Regeneration Framework. 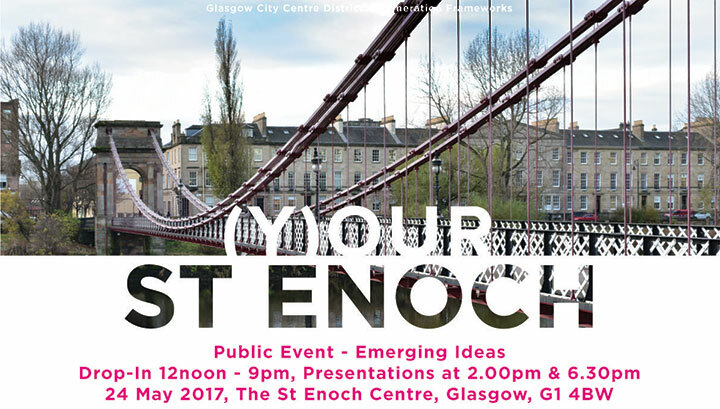 Drop in at any time from 12 noon til 9 pm on Wednesday 24 May to share your ideas and help shape the regeneration of (Y)our St Enoch over the next 10 years. Come along to presentations and workshops at 2 pm and 6.30pm to review and refine the Emerging Ideas. Glasgow welcomes millions of visitors each year to work, stay, visit and shop. Data recorded on footfall counters located at key strategic points along the Style Mile indicate that in 2016 alone over 55 million people visited the city centre. Autism affects 1 in 100 people in the UK. An autism-friendly city centre provides an opportunity for the Council and the business community to promote the city centre as an inclusive, family-friendly location whilst helping create a city where there is fairness, diversity and equality for all. Therefore, in the final week of Autism Awareness Month for 2017, Glasgow City Council’s City Centre Regeneration team, in partnership with Autism Network Scotland and the Autism Resource Centre, hosted a workshop to kick start Glasgow’s ambition to have an Autism Friendly City Centre. The workshop, held at the City Chambers, was attended by over 20 city centre organisations including representatives from shopping centres, transport hubs and museums. The day focused on how autism impacts on individuals and particularly those visiting the city centre. Debi Brown, who herself has autism, inspired the group by sharing her own experiences of the city centre while the Glasgow Film Theatre, who were awarded the Autism Friendly Award by the National Autistic Society, spoke about their journey and how businesses can achieve this by implementing simple changes. 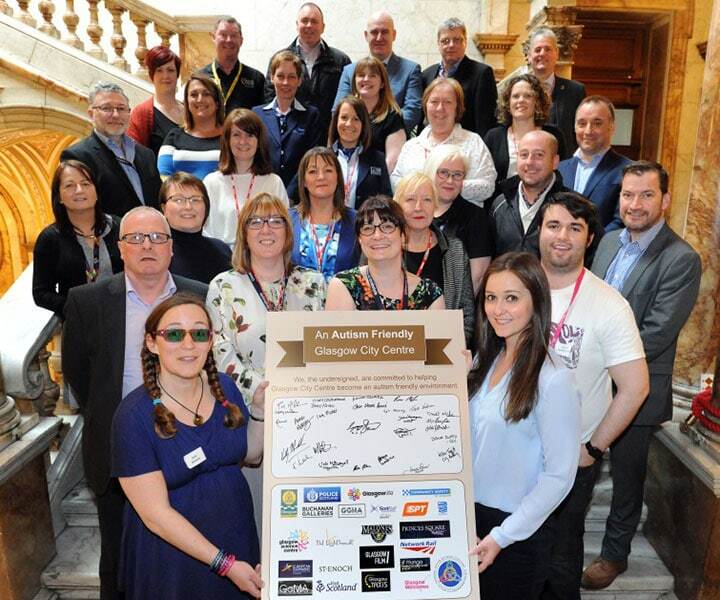 All attending organisations showed great enthusiasm to making Glasgow’s city centre more autism friendly and showed their intent by signing the commitment board. Our next step will be public focus groups with autistic people and their families to gather their opinions and advice. For further information on this, please see our news page for any updates. If there are any other city centre businesses/locations who wish to participate we would encourage them to get in touch with the city centre team.